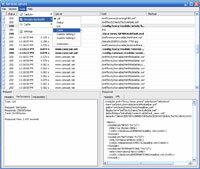 ServiceCapture runs on your computer(pc or mac) and captures all HTTP traffic sent from your browser or IDE. It is designed to help Rich Internet Application(RIA) developers in the debugging, analysis, and testing of their applications. Still not sure what it is? We have a free trial for you. Download it below. After it is installed and running, visit the Macromedia Exchange with your web browser. You should see a good mix of XML and Flash Remoting traffic deserialized into an easy to read format. 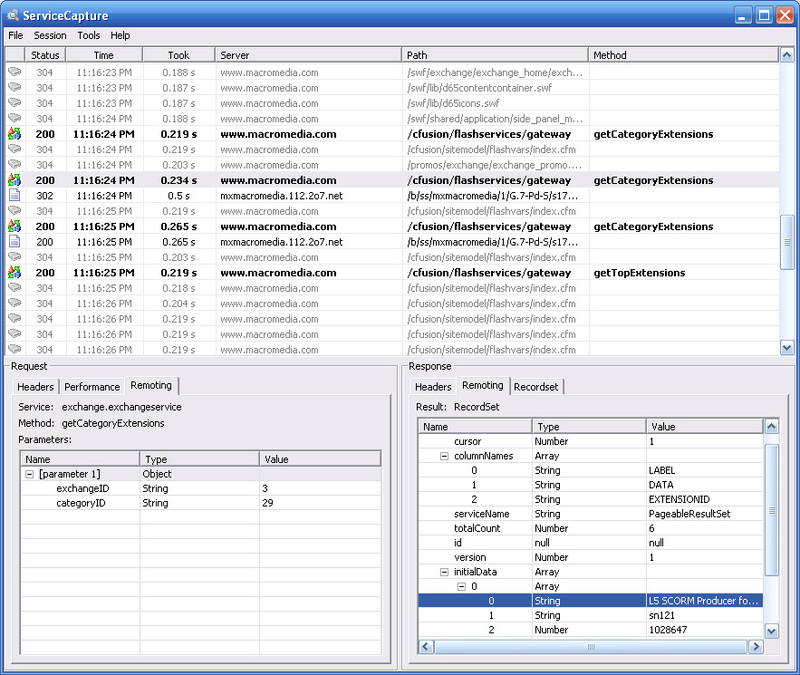 ServiceCapture is the only tool of its kind to deserialize and display all Flash Remoting or AMF traffic in a simple-to-use interface. ServiceCapture now also deserializes SOAP and JSON-RPC traffic into easy to use object trees. 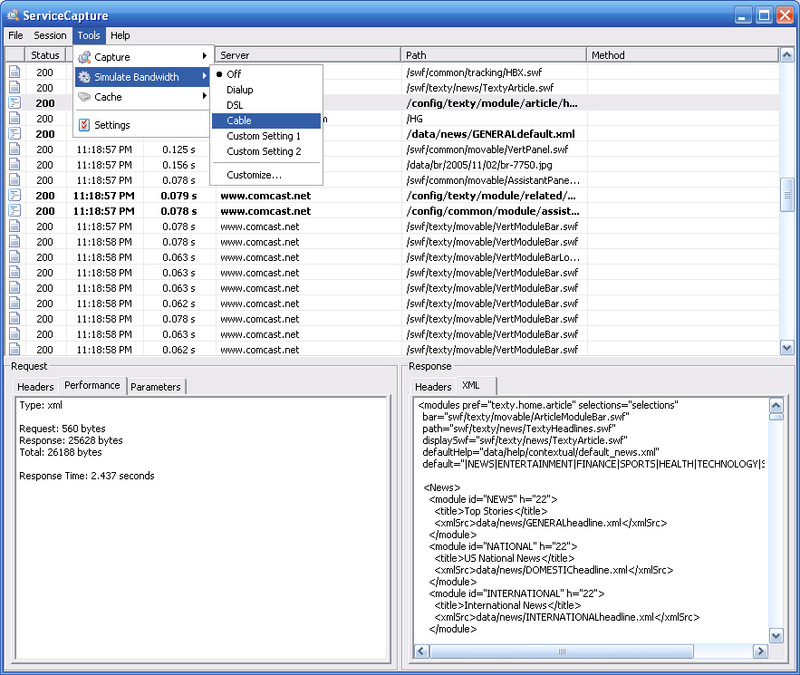 ServiceCapture also has a unique bandwidth simulation feature. This allows engineers to throttle their bandwidth to simulate dial-up, dsl, and cable connection speeds, even when your entire application is being served locally. Mapping URLs to files allows you to transparently replace a server response with data from a local file. This allows you to test and develop local files against remote environments. Now new in 2.0 version you can map urls to directories. This allows you to quickly simulate a full static webserver off your hard drive. ServiceCapture stores each request and response that happens from your computer. You can then resend any of these requests easily from the UI. This allows you to isolate and test a specific service call. No more signing in and recreating 33 steps to test one call back to the server. If you have the Flash Debug Player installed ServiceCapture will display all of your trace() calls within the same UI that you can watch your network traffic. You can now setup ServiceCapture to point at any text-based log file on your system and it will display logging inside the UI with the other events and network traffic. This is great for watching an HTTP Server error file for any issues that might be related to your browser's requests. What is new in 2.0? Does ServiceCapture work with Mozilla Firefox? 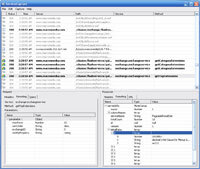 Why not use the NetConnection Debugger? Does ServiceCapture display SSL traffic? Can I use ServiceCapture with a network Proxy server? For questions not listed here try the help forums. I would love any feedback you may have. Please post here or send email to sc@kevinlangdon.com. Looking for an opportunity in RIA? Have a RIA position that needs filled? Naugle Group is the only recruiting firm focused 100% on RIA development. Find out more at: www.nauglegroup.com. Copyright © 2009 All rights reserved, Kevin Langdon.